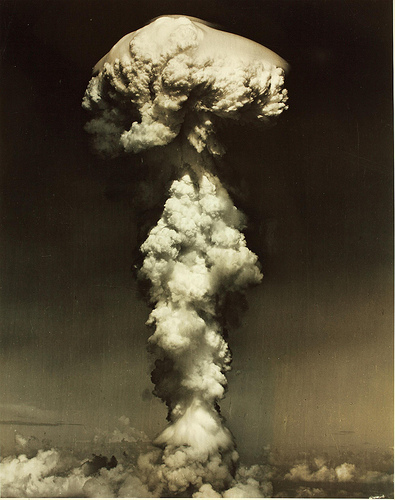 The dropping of the A Bomb on Hiroshima was horrific. The above article by Rupert Wingfield-Hayes of the BBC (The ‘sanitised narrative’ of Hiroshima’s atomic bombing) is full of reminders about the terrifying impact the dropping of the bombs had on the cities of Hiroshima and Nagasaki and the survivors. In it he uses Jamal as a vehicle for articulation of current American thinking about Hiroshima. Jamal is a young man and a student at Princeton University in the USA. The article appears to me to be a criticism of how and why the decision behind the dropping of the bomb has been viewed in America since the end of WW2. It appears to urge a rethink on the ‘sanitised narrative’. I would have to add that the American ‘sanitised narrative’ is also a view widely held in Britain, certainly by my generation and those older than me. The Allies lost many thousands of young men in WW2 in the fight against the fascist forces of Hitler’s Germany and the Japanese Imperial Forces. Many more civilians died at the hands of the Axis forces if not by fire bombing of towns and cities or sinking of merchant ships, then by starvation and cruelty in Japanese prisoner camps. The Japanese invaded island after island including here in the Philippines. They were within striking distance of Australia and bombed Darwin at the northernmost tip of that country. They invaded to the west also taking Singapore by force. Onward they went through Malaya (as it was then known) and into Thailand in an effort to take Burma. Burma at that time was a British protectorate.The Japanese became notorious for death camps, kamikaze, brutality and its aggressive expansionist policy. My own paternal grandfather was part of a Royal Navy Task Force serving on HMS Prince Of Wales. The task force was operating in the Pacific arena shortly after the fall of Singapore. The Prince Of Wales was sunk by Japanese torpedoes and kamikaze pilots partly as a result of the failure of its main guns. My grandfather was one of the fortunate crew members. He survived but over 1000 of his crew mates were not so lucky. Many people of my age know of family or friends who have a story to tell about the war against Japan. My ex-wife’s uncle to this day refuses to buy any product made in Japan. I thank God that I was born right after the war and didn’t have to witness these terrible things first hand. Let us not forget the mighty and bloody struggle to kick the Japanese out of the islands they had invaded. It was spearheaded by US Forces led by General Macarthur. The fighting was long, fierce and bloody. Eventually US bombers got within range of Japan after pushing the Japanese further and further backwards. The Americans at this time must have been in an awful dilemma. A conventional invasion of the Japanese mainland would have escalated the conflict even further resulting in terrible losses on both sides. And they must have considered this: would the Japanese psyche ever peacefully tolerate a massive force of occupation on their soil? On one hand you lose another several thousand young men in invading and occupying Japan. On the other hand you can use your new secret weapon – the atomic bomb. Yes the consequences for the Japanese people after Hiroshima were terrible. But this was war! The Japanese soon capitulated after the use of the bomb and putting an end to further horrific bloodshed. And when all is said and done – it was the Japanese who started it in the first place. Nobody asked them to invade Singapore, Malaysia, Philippines, Guam and all the other islands they annexed. No one asked them to bomb Pearl Harbor. Well Jamal the answer lies in the history books. War is war. Terrible things happen. I do not advocate war. However I will resist journalists, like Wingfield-Hayes, in retrospectively applying current political correctness values to some of the burning issues that had to be boldly dealt with by our leaders in the free world.